Kim Normanton presents a moving, personal programme about memory and dementia, inspired by her mother's illness. She explores a new approach to treatment - recreating the past. Kim Normanton presents a personal programme about memory and dementia, inspired by her mother's illness. She explores a new approach to treatment: recreating the past. As her mother's memory of recent events was destroyed, Kim discovered that she could only reach her by entering the past. She began sharing memories of her mother's childhood with theatrical props: "She can't reach where I'm living anymore, so it's up to me to go back to happier days in the past and reach her." This approach to dementia is tried on a much larger scale in Hogewey Dementia Village in Holland. 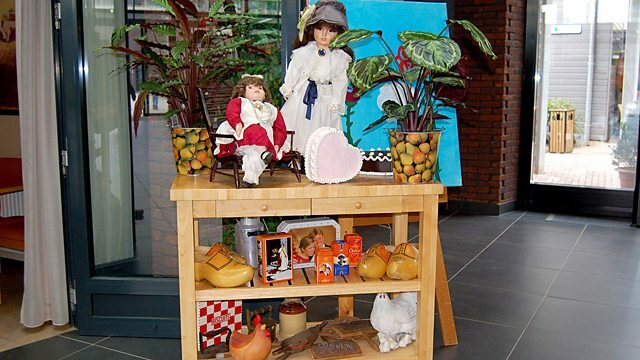 The village recreates the surroundings of the residents' youth, with old-fashioned furnishings, even a supermarket selling old-fashioned sweets. Kim talks to the director about ethical issues: is it right to deceive people with this 'Truman-Show' theatrical illusion? In Britain she finds care homes increasingly using 'reminiscence objects' to stimulate dementia sufferers to share memories. Kim visits a Cornwall home where Janet Brown, known locally as 'the Memory Lady', organizes group memory sessions using old toys and kitchen utensils plucked from a memory box. "It's a horrible disease and there's no cure, but there are moments which we can make more pleasurable for those living with it, and their carers." Kim explores the latest memory science with Dr Catherine Loveday of the University of Westminster: "The biggest problem with dementia is a lack of narrative: being suspended in space without the context of memories to support you. But I've seen people with dementia who are very happy - when you're reminiscing, you really are in that world and enjoying that moment." There are 800,000 dementia sufferers in the UK. Producers: Kim Normanton and Elizabeth Burke. Is it possible for people with dementia to be happy? Think-life aims to promote the mental and social well-being of older people. Reminiscence activities provide mental stimulation and opportunities for older people and those with dementia in care situations to reaffirm their identity, to give rather than receive. Think-life also provides training to enable carers to provide these services. For more information, visit the Think-life website. Alzheimer’s Society is a leading support and research charity for people with dementia, their families and carers. The Society provides information and support to people with any form of dementia and their carers through its publications, National Dementia Helpline, website and local services throughout England, Wales and Northern Ireland. Call the National Dementia Helpline on 0300 222 1122 or go to the Alzheimer’s Society website. Alzheimer Scotland helps people with dementia, their carers and families. Their members include carers, relatives, people with dementia, professionals, groups and organisations. 24 hour Dementia Helpline: 0808 808 3000 or visit the Alzheimer Scotland website. Alzheimer’s Research UK is a leading dementia research charity specialising in finding preventions, causes, treatments and a cure for dementia. They also provide information on the different types of dementia, their symptoms and available treatments, and help people to understand the progress research is making. Visit Alzheimer’s Research UK website. Wales Dementia Helpline offers emotional support to anyone of any age, who is caring for someone with Dementia as well as other family members or friends. The service will also help and support those who have been diagnosed with Dementia. Contact them by phone on 0808 808 2235, Text ‘help’ to 81066 or visit the Wales Dementia Helpline website.